Just when you thought the old Confederacy (of dunces) was making progress on the beer, there's bizarre news out of Florida regarding attempts to legalize 64-oz growlers. You know what I'm talking about. Half gallon growlers. The standard refillable containers at brewpubs and breweries...assuming you're a craft beer fan and you live in a sane state. Florida lawmakers have introduced two bills that would legalize these things. But the bills have been killed in committee without so much as a hearing. Why? Because the Florida Beer Wholesalers Association, which represents all of the state's Anheuser-Busch distributors and dumps a lot of money into Florida politics, opposes the idea. It gets better. A lobbyist for the FBWA claims the growler bill is a problem because it would threaten the three-tier system of distribution established after Prohibition. As most who follow theses things know, the three-tier system mandates that alcohol pass through a distributor on the way to the consumer. This rationale is such horseshit. It's nothing but a transparent and shortsighted falsehood meant to protect the interests of AB in Florida. First, craft breweries and brewpubs all over the country, except parts of the South where there still aren't a lot of breweries, have been selling beer directly to customers for years. It's complete garbage to suggest that such sales are a threat to the three-tier system. Time for a reality check if you think they are. 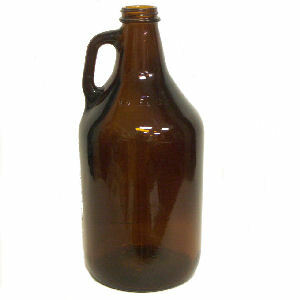 Second, and even worse, it turns out Florida already allows beer to be sold in growlers. You read that right. You can go down to your local pub today and get a 32- or 128-oz growler filled. No problemo. But you can't get a 64-oz container filled due to a loophole in the law. Talk about stupid and contradictory laws. It should be noted that not all Florida beer distributors are out of touch. The Beer Industry of Florida, which represents distributors who don't sell AB products, supports the move to legalize 64-oz growlers. It only makes sense to them. But it's quite hard to change these laws when you have the power and money of AB pushing in the opposite direction. Ye gods! When I wrote about the treachery of "Grab Some Buds" a while ago, this is exactly what I meant. These people use money and power to block laws that make sense because they fear it will mean competition. And they're right...it will lead to more competition. And better beer. Everyone needs to stop buying AB crap until they stop blocking sensible beer laws.